Home » VW Jetta » How safe is the Jetta? Are you looking for a new sedan with forward-thinking safety technology? 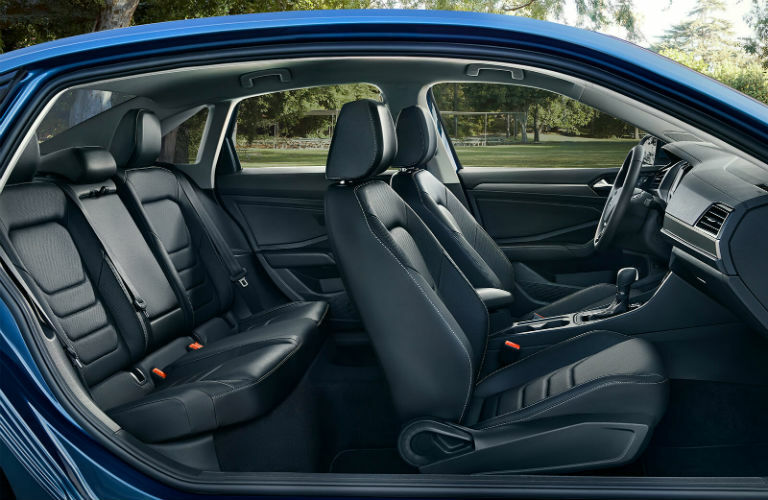 The 2019 Volkswagen Jetta has plenty of ways to help you better protect yourself while you’re behind the wheel. We want to show you what this vehicle has to offer for you and your family. Let’s take a look at the 2019 Volkswagen Jetta safety features today. When you are out and about at night or get caught in the rain, you need to be able to see and be seen by other motorists on your journey. The 2019 Volkswagen Jetta comes equipped with LED headlights, LED Daytime Running Lights (DRL), and automatic headlights. The Jetta also has available heated side mirrors to help you clear the rain and snow for greater visibility. Now that you know more about the 2019 Volkswagen Jetta, let’s take a look at some of its other safety technology. The 2019 Volkswagen Jetta is designed with the latest technology. It has fun entertainment features and amenities. It also has great safety features to help you reach your destination safely. The Jetta includes Electronic Stability Control (ESC), Anti-Slip Regulation (ASR), and an Anti-lock Braking System (ABS). The Jetta also includes Side Curtain Protection® head airbags in the front and rear as well as a Tire Pressure Monitoring System (TPMS). These tools can help you stay in control, protect you and your passengers and better maintain your vehicle. The 2019 Volkswagen Jetta safety features are just some of the interesting parts of this vehicle. If you are looking for a new sedan, you can check out our online inventory to see what kind of 2019 Volkswagen Jetta models we have available and schedule your test drive with us at Speedcraft Volkswagen today. What trims are available for the Jetta? How far can I go in the Jetta? How much room is inside the Jetta? This entry was posted on Tuesday, January 8th, 2019 at 12:52 PM	and is filed under VW Jetta. You can follow any responses to this entry through the RSS 2.0 feed. You can leave a response, or trackback from your own site.